It may come as a surprise that I don’t have a very long history with homemade waffles, even though I now adore them. Growing up, my grandma had a few standard breakfast options available when I’d sleep over at her house that we never had at home. They were, in no particular order: Brown Sugar-Cinnamon Pop-Tarts, bagels that she would cut into fourths to increase the cream cheese to bagel ratio (such a smart woman! ), and Eggo waffles. I definitely got my peanut butter gene from my grandma, as she would slather it on anything and everything, including Eggo waffles. This was one of her favorite breakfasts (or lunch or dinner!) right up until she passed away at age 91. As a result, it became one of my favorite weekend breakfasts, as well. Toast the waffle, then cover it peanut butter and jelly and eat it like toast. I haven’t had it in years, but just writing about it, I can almost taste it. I didn’t encounter the world of “real” waffles until I went to college and found the Belgian waffle station in the cafeteria. Talk about a eureka moment. Who would dare complain about cafeteria food when you could make your very own Belgian waffle for any meal you’d like? I relished my newfound teenage freedom and ate my weight in Belgian waffles my freshman year of college. Once out of college, having my very own Belgian waffle maker was of the utmost importance. I got one and began enjoying the occasional Belgian waffle at home. 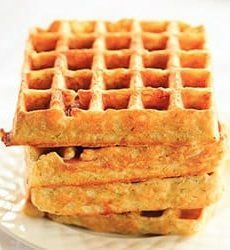 For a long time, I used boxed waffle mixes to make my batter, but finally found the perfect homemade buttermilk waffle recipe. 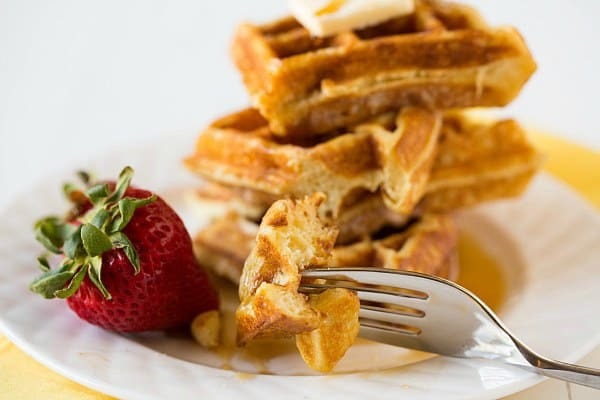 It’s incredibly easy and makes the most delicious waffles. Homemade waffles are such a great treat and making them completely from scratch takes maybe 2 or 3 minutes longer than making them with a baking mix. You probably have all of the ingredients you need in your pantry already, so grab some buttermilk from the store, and get whisking! Homemade waffles feel like such an indulgent treat, served alongside bacon or sausage – talk about comfort food. It may have taken me awhile to get here, but I’m so thrilled to have the ability to whip these up at a moment’s notice! 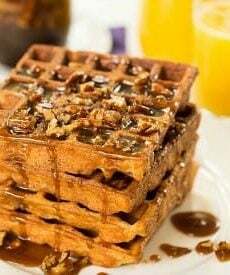 You can use this recipe whether you use a Belgian waffle maker or more traditional waffle iron. For those that might be curious, I currently use this Waring Pro Belgian waffle maker, but I have also heard fabulous things about this Chef’s Choice model, which takes up a lot less storage space. 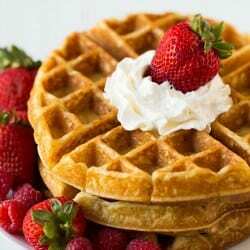 How do you like to serve waffles? Fresh fruit and whipped cream, or the traditional butter and syrup? I’m a butter and syrup girl all the way! 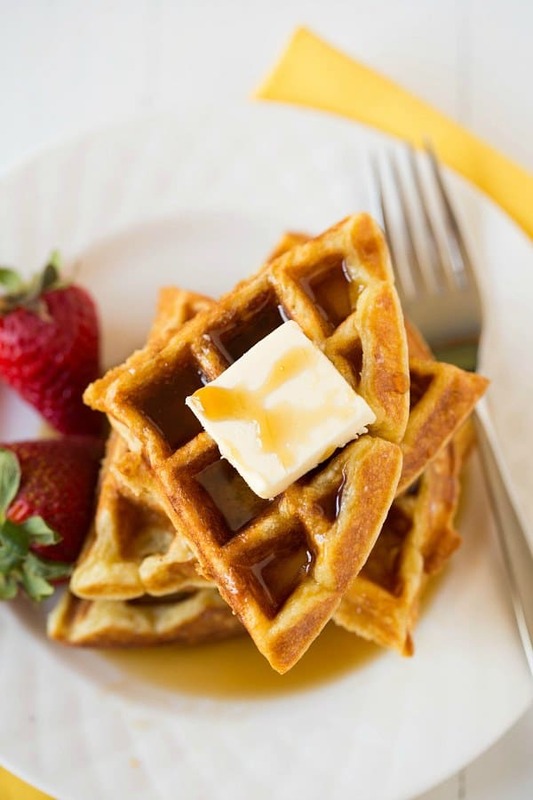 A classic recipe for buttermilk waffles - the perfect way to make any morning extra-special! In a large bowl, whisk together the flour, sugar, baking powder, baking soda and salt; set aside. In a medium bowl, whisk together the buttermilk, butter, eggs and vanilla extract. Add the wet ingredients to the dry ingredients and gently whisk to combine. Do not overmix! Spray a waffle iron with non-stick cooking spray, then preheat. 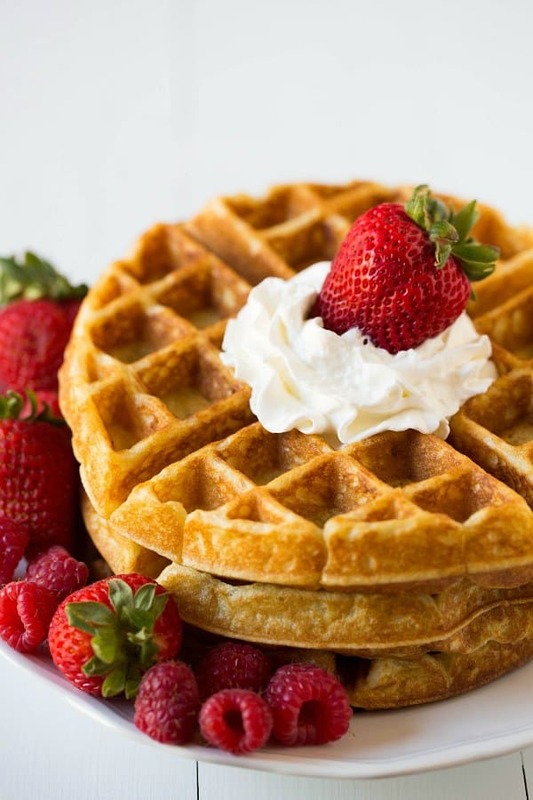 Once the waffle maker is ready, add the batter according to the manufacturer's instructions and cook for 2 to 3 minutes, or until the waffle maker indicates they are ready. Serve immediately, or place in a 300-degree oven to keep warm. 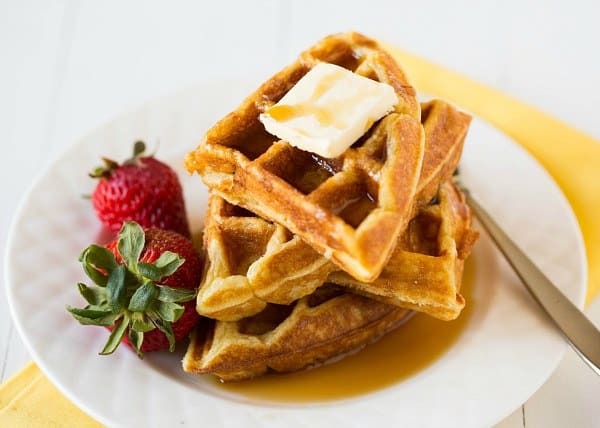 Leftover waffles can be wrapped in plastic wrap, placed in a ziploc bag and stored in the refrigerator for 2 days or in the freezer for up to 1 month. Can this recipe be made with gluten-free free flour? If so are there any modifications that need to be made? Made these this morning, they were absolutely delicious! 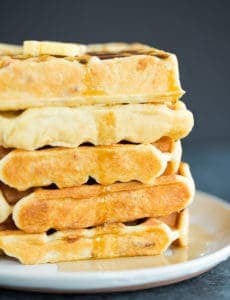 I’m always trying new waffle recipes and this one is at the top of the list! crunchy on the outside, soft and tender on the inside!! Thank for a great recipe. So glad you loved them, Marcie! Followed the recipe to a tee. Two bowls: wet and dry. Great way to use a pint of buttermilk, which is hard to find. The end product was light. This was the first time using the low-end, round, waffle iron. Homemade blueberry compote was a formidable complement. Leftovers were wrapped individually in plastic wrap then stored in the refrigerator. In your recipe, the eggs are separate or not! I did not separate the eggs and they are still a great waffle. They should not be separated. I made my batter on Sunday at 10am. I probably had the batter out of the fridge for 20 minutes. I used some of it this morning – no issues. Tonight, around 6pm, the batter had mold in it ( a significant amount) – quite frightening. Hi Michael, Oh no! It certainly could have been a reaction with the milk powder and/or seltzer. I’ve never used either in a batter. Wow, these are without a doubt the BEST buttermilk waffles I have ever tasted! I will serve with lightly cooked pears (in butter of course) next time. Your recipe reminds me of the waffles I used to have at a fabulous french bakery. Thank you! Your blog is superb!! Made these for breakfast today, and everyone raved about them! Quoting my fiance, “That’s a damn good f***ing waffle”! :-) Thank you so much for the recipe! The world would be a better place if people commented on recipes they have actually tried, rather than remark how pretty it looks! I made these waffles tonight and having tried many recipes these are the perfect combination! Not too airy, not too dense, great flavour and they toast up well in a toaster for breakfast the next day. Thanks for the recipe, it’s going to be made again and again. I made this recipe yesterday with a cheap waffle maker, they didn’t look as pretty, but they tasted great. Thanks! First, thank you for this and all your other wonderful recipes. I do have a question on this recipe though, my waffles came out really “eggy/sulfery” (if that is even a word) and also became soft really quick. I am a bit spoiled as I love the Carbon Malted premade waffle mix, but love making everything from scratch. Do you have any advise? Thanks! Hi Abe, I’m not sure why that would happen; I actually just made these last week and they did not have an off taste and they were quite crispy. Make sure your heat is turned up high enough on your waffle maker. How long would you recommend saving leftover batter? I saved some and on the 3rd day it had all these little dark spots. It looked like it had bananas in it but it didn’t. Can you make it ahead and freeze it? Hi Robin, I recommend using this batter as soon as it is mixed. If it’s left to sit, the leavening agents will lose their potency.